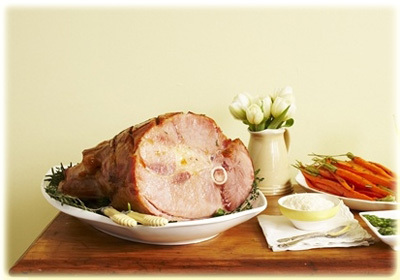 When Easter time comes around each year, our family usually has a ham. For us, it's a big dinner --- to use an old fashioned expression, a feast. Now that we are raising our own pork, the dinner provides us with the added pleasure of knowing it's healthy. It is really a joy to know where your food comes from. Something unique about our hams is the exceptional flavor of the meat. Part of the reason for that is the special nature of the fat. It's good fat. Filled with nutrients that heal our bodies and nourish our bones. Researchers say it's rich in monounsaturated fats and vitamins A and D. They've rediscovered the myriad benefits of fat from organic, outdoor pigs. Ham is particularly delicious when it's roasted with the bone-in. Remember when butter made a come-back a couple decades ago? The same thing is happening now with lard (and pork fat in general) --- with some scientists claiming the health benefits exceed butter. This is good, but nutrition is just a part of it. What's equally important to us is the way the animals are treated. How they live. Seeing them laze in the sunshine, shoveling dirt with their noses, foraging for roots and bugs. It certainly is glorious. But back to the hams. We like ours with the bone in. The rich goodness of the marrow seeps into the meat, imparting exceptional taste and healthy nutrients that can only be found in the bones. If you order a ham, ask for the bone-in. It adds to the experience, in our opinion. And one more thing --- about the beef. We should have more in-stock in about 4 weeks. Thanks for being patient, we know we've been low on certain beef products for awhile.